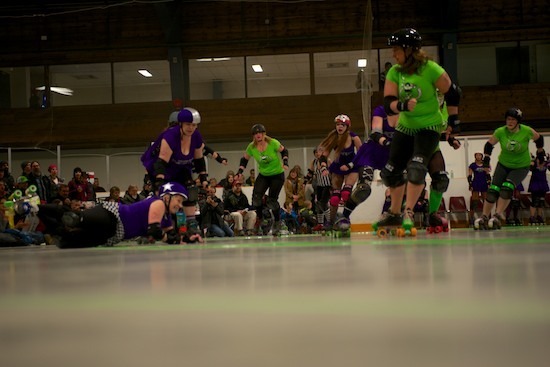 The Peterborough Roller Derby team opened their season Saturday night (April 20th) as the Jamazons (in green) took on Oshawa's Motor City Madames. Although they lost 214 to 99, it was neck and neck up until halftime—and a blast to watch. Follow the Peterborough Roller Derby on Facebook and Twitter, and be sure to catch the rest of their season at the Kinsmen Arena (1 Kinsmen Way) on May 26th, June 8th, July 6th and July 27th.